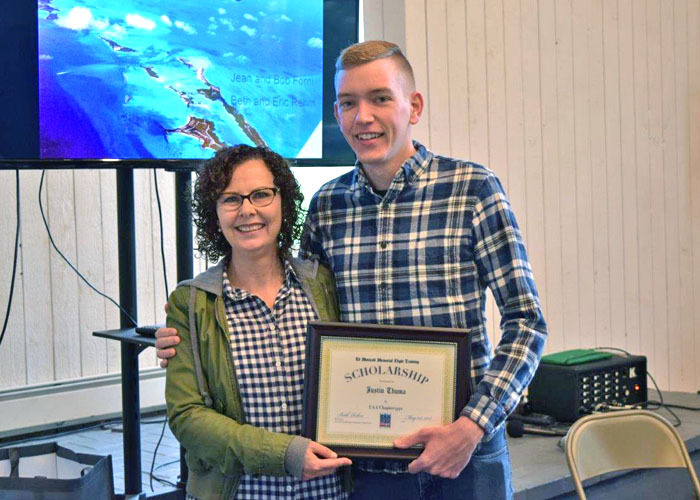 EAA Chapter 932 Scholarship Committee is pleased to announce the 2018 winner of the Ed Moricoli Flight Training Scholarship is Justin Thuma. The award was officially presented to Justin Thuma at the Chapter’s May12th meeting. Justin has been interested in flying since 3rd grade when he began playing with flight simulators. He went on to take several Young Eagles flights and attended EAA Air Academy in Oshkosh, WI. He maintained his passion for aviation throughout college while he earned a degree in Industrial Engineering from Bradley University. Justin is extremely motivated and already passed his private pilot written exam and will begin flight training with the flight school at Galt this spring.